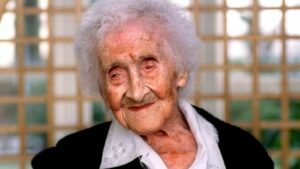 Jeanne Calment has been considered the world’s longest lived person since she died at the age of 122 in 1997. She allegedly smoked until she could not light a cigarette without assistance. Recently, a Russian gerontologist and a Russian mathematician have questioned her longevity and floated the theory that Calment stole her mother’s identity for the purposed of avoiding French inheritance taxes in the 1930’s. Their theory is that she did not look or act that old. The result is that Calment was only 99 when she died. 1. I always enjoyed the part of Calment’s bio where she sold her apartment when she was 90 to a man who agreed to pay her a monthly sum until she died. She outlived him by two years so he wound up paying 2X for the real estate. 2. Like many points of French governance, the estate tax laws are complicated. Nonetheless, the tax rates are not so confiscatory that compliance merits identity theft as a means of avoidance. 3. Is there any type of disinformation campaign that Russians will not engage in?